I remember fondly a bread machine we got from value village a looong time ago, and the excitement of such proper-looking bread coming out a few hours later. We had for a while a deep fryer… I think we must’ve used it a few times to make yam fries. This was when I was quite young. I don’t remember the rationale behind purchasing a deep fryer. Then there was our old Oyster blender– we had a homemade mango ice cream bubble tea phase. Our old Hamilton Beach hand-mixer, which I used to bake my very first cakes. A coffee machine. I remember trying to use the filters as cupcake wrappers because I didn’t have a cupcake tin nor wrappers. Of course, the batter just gushed all over the place. Those alllll have disappeared into that mysterious place where old appliances end up. Currently, we have–and I realize we are very lucky–a KitchenAid mixer (dream since I was a kid), a Blendtec (which my mom adores), a juicer, and a food processor. Which we all actually do use on a weekly basis. Oh, plus a waffle iron, which I guess is that one appliance that gets forgotten a lot. Anyway, because of the wealth of appliances we have, buying an ice cream machine is out of the question. Resist temptation. If we owned one, I’d no doubt be churning ice cream every week, and we’d no doubt be a bit more fluffy all around. I believe the original recipe for a one-step no-churn ice cream came from Nigella Lawson, and other methods floating around for no-machine ice cream. But this one is by far the simplest, requiring only 2 core ingredients, your choice of flavour additions, and just one step. Sometimes alcohol is added to lower the freezing point of the ice cream, to reduce iciness, if I remember correctly. and an ice cream shop that I think wins them all in terms of unique flavours, is offering Goats Milk and Lingonberries, Kimchi and Rice, Peking Duck Buns… for a short time. The classic flavours they have on rotation include Pear & Blue Cheese, Strawberry Honey Balsamic with Black Pepper, Almond Brittle with Salted Ganache… yes, it’s Salt&Straw. 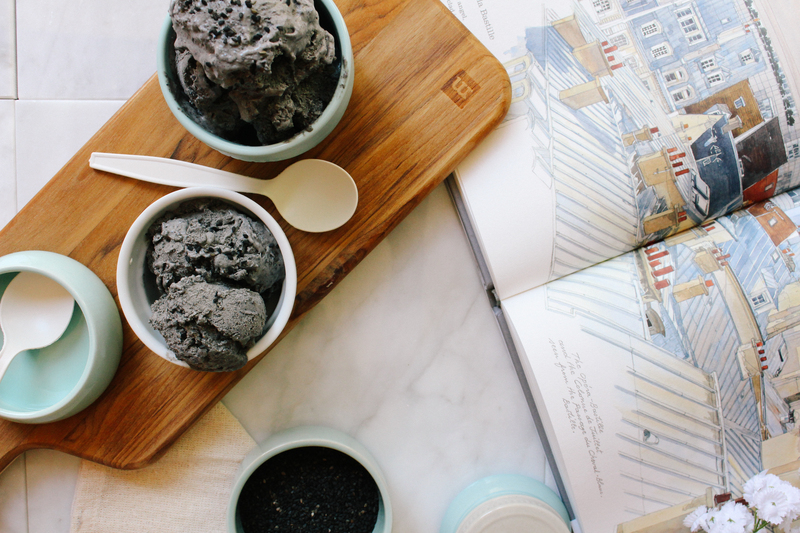 For my first ice cream venture, I wanted to keep things relatively simple with a black sesame ice cream, but I wanted the flavour to come out really strongly. I was thinking if it could even come close to Bella Gelateria’s in terms of depth, richness and flavour, I’d have hit a home run. My intent was to extract as much flavour from the seeds without affecting the texture of the ice cream too much. 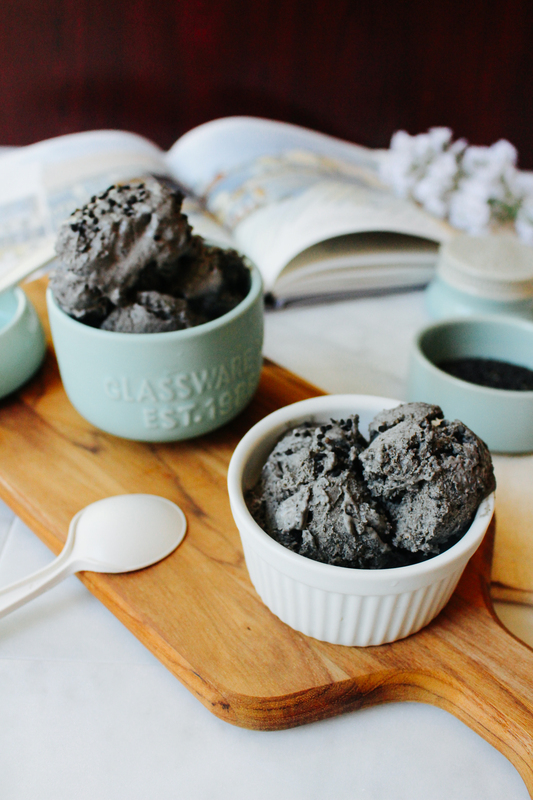 I scoured the web but I didn’t see any recipes that used any more than a few tablespoons of ground black sesame paste, which doesn’t cut it for me. 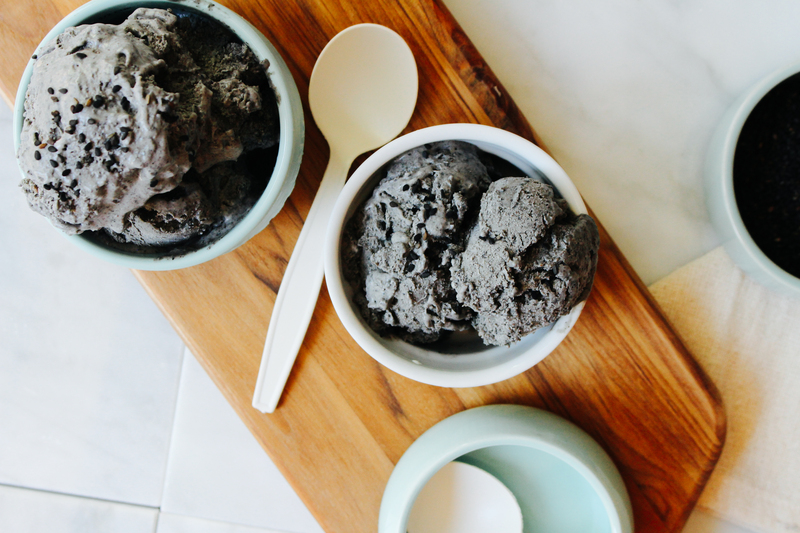 So you’ll see from the recipe below how I went about it, and overall I think it turned out pretty well… it’s rich and creamy, with a distinctly black sesame flavour, and the condensed milk is not too sweet, as I had feared. It actually adds a subtle layer of caramel flavour in the background, which I think is quite pleasant. 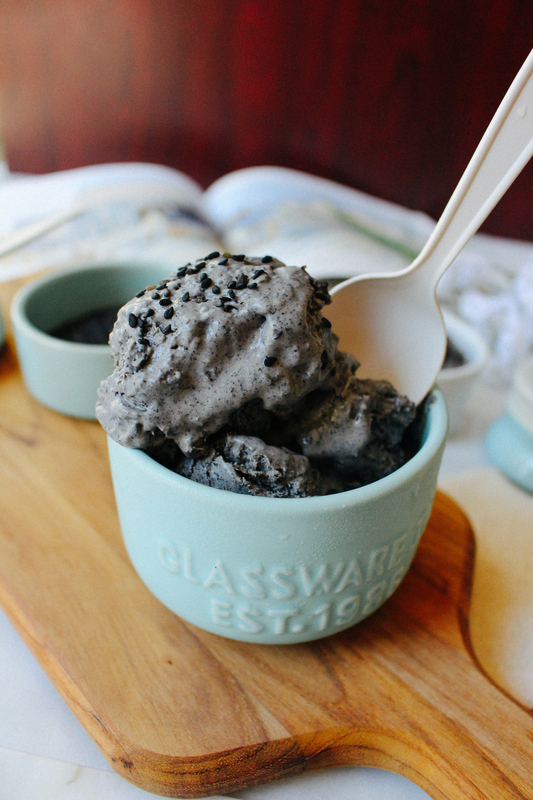 However, it’s not nearly as fluffy and airy enough as ice cream usually is, which is probably due to the large proportion of black sesame that’s in there. It’s actually sort of chewy, which still makes it pretty cool in its own right. The no-churn ice cream experiments shall continue, and I welcome your input on how to achieve maximum flavour without compromising the texture! I had thought about straining the cream mixture from the sesame seeds, but after its 24 hour infusion, it had became pretty much homogeneous, and the cream mixture was too thick to strain. Wishing you all a happy start to a very hot week– cheers! Heat a large nonstick skillet over medium heat. 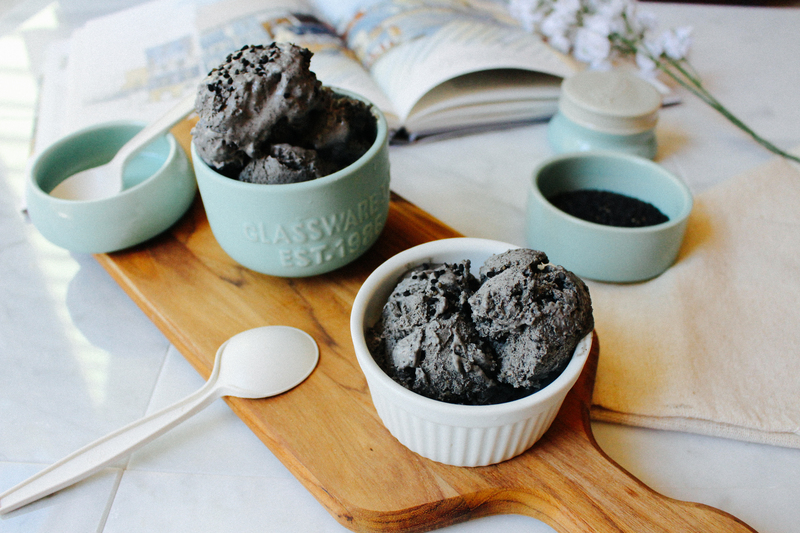 Toast the black sesame seeds until they’re fragrant. Transfer to a heavy-duty blender, and add 1 cup of heavy cream. Blend until the seeds have been completely obliterated. Heat the remaining 1 cup of heavy cream in a medium saucepan over medium heat, until it reaches just under a simmer. Take it off the heat. Pour the black sesame-cream mixture into the saucepan. Cool down the mixture, then place in the fridge to allow the flavours to infuse for 24 hours. The next day, transfer the black sesame cream into a mixer with the whisk attachment. The mixture will be thick already, but whip until it’s very thick, with stiff peaks. The consistency will remind you of frosting or buttercream. In a large bowl, whisk together the condensed milk and few tablespoons of black tahini, if you have it. Fold half the black sesame whipped cream into the condensed milk mixture to lighten it, then quickly fold the remainder in. Transfer to an air-tight, freezer safe container and freeze for 4 hours or overnight.